At Evendine House, we strive to provide high quality care and support in a friendly, relaxed and welcoming environment. Our dedicated and passionate team work hard to ensure that our residents feel happy and comfortable at all times. We offer a wide variety of daily activities that are all designed to appeal to residents. Our activities are aimed at supporting residents’ holistically and focus on enhancing their social, emotional and physical wellbeing. Our skilled Activity Coordinator works closely with the residents and their families to identify individual likes, interests, and hobbies. This information is then used to further enhance the quality of the activities that we provide by making them more personal and enticing. Additionally, we have found that this personalised approach supports residents transition into their new home. We always consider our residents’ capabilities and work hard to protect their independence and dignity. This is why we encourage our residents to help with day-to-day activities such as simple food preparation and folding clothes. 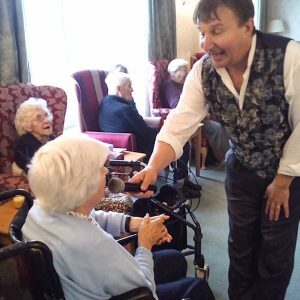 By doing this, our residents are able to feel more involved and at home at Evendine House. The activities that we offer encourage residents to get active and socialise with other residents, friends, and family. We provide a range of stimulating activities that enable residents to pursue their current interests and learn new skills. Some of the activities that we offer include arts and crafts, music therapy, exercise and walks, live entertainment, and more! We love to hear our residents’ stories and memories from the past. By sharing these experiences, residents are able to socialise and build friendships with both residents and staff. This also helps our residents feel more comfortable, happy and relaxed in their new home. 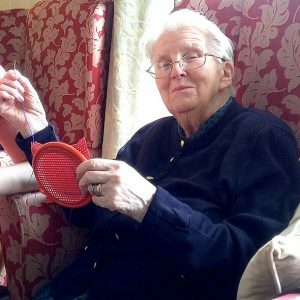 Our residents particularly enjoy our stimulating and fun activities that are designed to help them reminisce. Residents are able to join in with fun games such as ‘What is in the box?’ which uses old memorabilia to support cognitive processing and memory retention. We tailor our activities and games to suit the needs and interests of our residents. Our caring and compassionate Activity Coordinator works with residents and their families to establish individual needs, interests and hobbies. By doing this, we are able to offer an assortment of appealing activities. Our fantastic care team work in partnership with residents and their families to create a Personalised Care Plan. The Personalised Care Plan details any specific needs and requirements that a resident has. Additionally, this is used to highlight a resident’s individual likes, dislikes, hobbies, and interests. At Evendine House, the care and services that we provide are personalised for each resident based on the information in their Personalised Care Plan. Our dedicated team also review all residents’ Care Plans regularly to ensure that they are kept up-to-date and staff remain informed. We work closely with local healthcare professionals to further enhance the quality of the care that we provide. These professionals frequently visit Evendine House to offer their services and expertise to our residents; some of these include GP’s, district nurses, optometrists, dentists, and chiropodists.